A warm scam-o-welcome to Witold Padarewski, who would rather do things by the book, even (or especially) if it wastes a lot of Lad time. A few classically scamalicious elements are highlighted for the edification of the new visitor. I know you will be very surprised to read from someone relatively unknown to you before. I must a= pologize for this unsolicited message to you, I want you to know that the essence of this message is strictly confidential and for mutual benefit between you and I and nothing more. I am advocate Jean-Claude AVIANSOU , the private attorney to Late Engr. Markus Paderewski, a national of your country and an Ex-Director of (TOTAL BENIN) an oil servicing company based in Benin Republic West Africa, Here in after shall be Referred to as my client. On December 25, 2003., my client and his entire family were involved in chartered Boeing 727 jet bound for Beirut,Lebanon, that crashed after hitting a building on takeoff, killing at least 140 people including my client and his entire family as the where heading to Beirut for Holidays. Since the incidence, I have made several inquiries through your embassy to see if I could locate any of my clients extended relatives,but all to no avail. After these several unsuccessful attempts, I decided to track down his last name over the Internet, to locate any member of his family hence I contacted you. I have contacted you to assist in Repatriating the funds and other valuable assets(GOLD) estimated at about $25.3M USD (Twenty five million three hundred thousand United state Dollars), left behind by my late client before his death in 2003.These huge deposits were particularly lodged with the "AFRICAN DEVELOPMENT BANK " An affiliate of Commercial Bank of Africa where the Deceased lodged the money and the valuables before his demise. The Bank has issued me a notice to provide the next of kin to the deceased or the account will be confiscated and declared unservice-able by the Bank here. Since I have been unsuccessful in Locating the relatives for over 5 years now, I seek your consent to present you as the Heir apparant to the deceased (next of kin) since you have the same last name so that the proceeds of this account valued $25.3 million United States Dollars can be paid into your account and then you and I can Share the money ...50% to me and 50% to you. I will use my position as an attorney to procure all necessary legal documents that can be used to back up this claim. Your Telephone, Mobile and Fax number for Communication Purpose. For privacy please call me +229-98222692. I appreciates your prompt responds to my proposal, this proves you are a highly qualified and the right person to handle this transaction with me. I'm really impressed after reading through your profile from the human resources database on the internet and that is why I am confident in your capability to handle this transaction with me. Before I give you more details on the procedures I want to re-assure you that you have nothing to worry about or to loose, all we need is someone who has the same last name with my deceased client. The most important thing we need is that last name Paderewski.I also want you to know that all necessary legal framework and arrangement has been set in place before I contacted you, so there is absolutely nothing to worry about;=C2 all I require is your mutual understanding and honest cooperation to enable us seeing this deal through. Meanwhile, I want to remind you that we have a code of conducts guiding this business, our rules and regulations must not be violated or breached by any party. Firstly, It=E2=80=99s said that we must not disclose this business deal to any body, organization or authority, that the transaction must remain a confidential business deal between me and you, that we must not involve a third party or disclose any information related to this business to any single person be it friends or relative to avoid eyebrow or double application and to mark a successful conclussion of this transaction. That is to say that every details of this transaction must be treated with utmost confident. Before we proceed I want you to realise that we are not harming any body or family, you may ask why you are to stand as the deceased next of kin instead of a real relative of the deceased to stand for this claim, the answer to such question is simply that my Late client had no existing relative to claim his balance from the bank since the demise of his death in the year 2003 all effort to locate his extended relative and family members through their consulate and foreign affaires ministries where all in vain. Un-operative account can no longer exist more than six years in African development banks, after two year the account would be placed under dormant vault, then after some six years the account must be closed as unclaimed bill if the owner(s) or relatives of the account beneficiary fails to claim the fund left in the account. I have receive ultimatum of only 21(twenty one) working days as the deceased attorney to present the deceased heir or have the account confiscated and closed as unclaimed bill, another question is when this account is closed as unclaimed bill what happens to the money, the answer is this, 70% of the total sum goes into government treasury account at the apex government Bank, while 30% of this fund is shared amongst the Governing Board of the Bank. You will agree with that leaving this fund to disappear just like a thin wind is senseless when I have all the facilities required to claim this fund through your help. You are to stand as the next of kin to the deceased since you have same lastname with him, that's all I need because I have all documents and information required to make this things happen. I must give you guarantee that you will not face any queries or hindrance now or after the successful conclusion of this business transaction, you can agree with me that I can not associate my self in any business/transaction that might bring curse or problems to me or my family as a married man and a father of three kids. Moreover am a legal practitioner and a court advocate and a politician. I cannot just damage my hard earned reputation because of this money; my plan is to contest as a member of my country's national assembly so I have no reason to dent my political carriers. Without wasting much time, I will have to explain how we are due to commence the transaction. I have draft a specimen text of application which you have to filled with your information and send to the African Development Bank via E-mail. This application is to be sent to the Director General of Foreign Operations of the African Development Bank Benin (AFDB) in the person of Mr. P.C. MORIS. The Director have already assured me of his maximum co-operation in this transaction as long as you can be able to provide supporting evidence to the claim, the supporting evidence is just some documents related to this account and some evidence of death, all this are available and I'll provide these documents and other information to you upon the demand by the Bank. All you have to do is to forward any information you receive from the bank to me so that I can go through it and assist you where necessary. I'm also getting my self ready to come over to your country for more business negotiations and sharing of the fund once this fund is transferred into your account. Moreover, the bank here will send inheritance documents to your bank, so your bank will not ask you any question on how you make this money, so you are just free of any question after all. Attached is my passport for your view. Application for the release and transfer of 25.3M (Twenty five million three hundred thousand united states dollars only) from African Development Bank (AFDB) dormant vault A/C N0: 14-255-2107. Please be informed that I wish to come for the claim, release and transfer of the sum of ($25,300,000.00 USD) from account number A/C N0: 14-255-2107 with your bank. Having been informed of this incident by the deceased personal attorney, Avocat Jean-Claude AVIANSOU that the above amount of money/Gold valued the stated $25.3M USD was deposited in your bank by my deceased relative Late Markus Paderewski. I wish as the heir apparent with all documents of proof to claim and instruct that the above-mentioned amount be released to me by bank draft or cheque through any of your correspondence financial institution either in Europe or Americas. 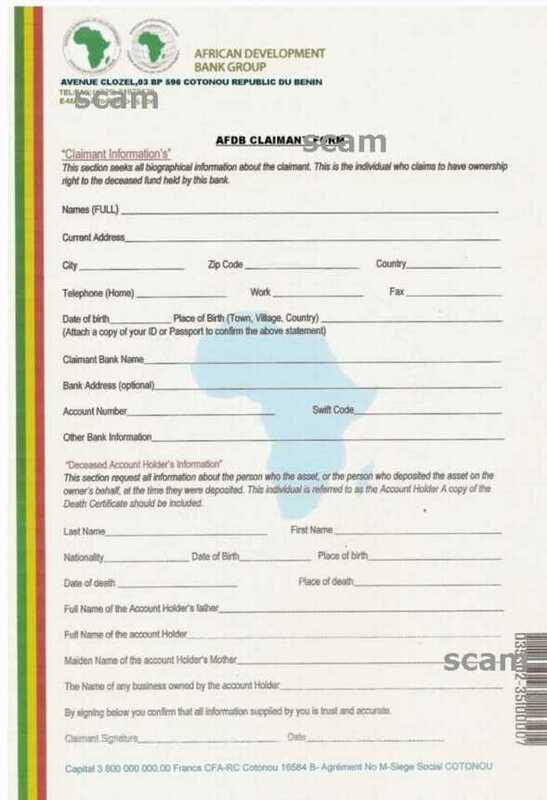 I also humbly request for the services of an accredited resident bank attorney who is empowered by the Economic Community of West Africa States (ECOWAS) to represent me for the authentication/ updating of my documents that will be required to ensure speedy transfer of this fund to my bank account as I cannot be physically present there due to my official engagements here. Please accept this late application, I hope you will understand and expedite action. First of all, I'd like to thank You for contact and for trusting me. In order to consult my decision and obtained release fund application, I have presented the document to my lawyer here in Poland. I had been informed that, because the statement that says that I am next of kin and heir apparent of Your deceased client, there is a risk of accusing me of fraud or perjury. I know that i could be connected with Markus Paderewski, but, even if I were close relative of Markus Paderewski, my living father is closer one. So, this false statement could lead me to prison in Benin for breaking local law in Your country. So, I had modified the content of the file which You have kindly sent me. I have declared that I am not sure whether I am heir apparent of Your deceased client and I ask AFDB to suspend the account enclosure procedure. Moreover, I have given You a permission to start the investigation in Poland that should decide whether I am relative of Markus Paderewski. Besides, it remains doubtful to me, that I could give You permissions or dispositions of such important manner through an electronic mail which is not digitally signed. I have asked (of course without saying anything about our case) a local notary and acquired information, that a valid agreement in Poland can be only prepared on paper, with written signatures of both sides on it. I know that probability of acquiring such amount of money is very alluring, but I am just aware of the risk too. 1) You, with my permission, will suspend the enclosure of Markus Paderewskis account in AFDB. I am sure, that You will manage to do it, with Your position in Benin. 3) After the search, You and my lawyer will prepare legal agreement which will be signed by all involved people and authenticated by local notary NOTE: as long as I don't have such amount of money, I could not defray Your expenses connected with Your visit in Poland, even when we fail to claim the money from AFDB. But I am sure, that we can manage this with Your law experience and my knoledge about Paderewski family. 4) The money will be shared according to degree of relationship with Your deceased client. Additionally, you can take 55% of the money due to Your involvment in this case. I would be very grateful if You could send me some personal data of Your deceased client, such as his birth place and date, date of leaving Poland, names of his parents and grandparents. With this data I could start searching for relatives of Markus Paderewski in polish citizen registries. So, when You will come to Poland, I will probably have a list of relatives to check. I know that You would rather me to write that I am heir apparent of Your deceased client, but this statement would be only risk for me, as long as You could say that You have believed me. Hence You would evade consequences and I may be asked to return the whole amount of money from AFDB, when the bank or local authorities finds out that I am not the closest relative or not a relative of Markus Paderewski at all. In Poland, and in all other countries that I checked it is impossible to inherit money without proving, through documents or genetic analysis, that one is a relative of the deceased testator. I haven't told You earlier, but I am an organizer of genetic examination of potential bone marrow donors in Toruń, PL. It's a big charity initiative and due to this, my finances must remain transparent and clear. P.S. I'd like to repeat my kind request. Could you call me just once to calm my nerves? You know that this amount of money is unbelievable to me and I am kind of suspicious. I mean I completely believe You, but I'd rather to hear Your voice and, of course, meet You in person in Poland. P.P.S. Finding even a hundred of heir apparents and obtaining (legally) 0,45 % of heirloom will fully satisfy me needs and, because it would be legal, it will give me no fear of consequences. P.P.P.S. It is very important to me to obtain data about Your deceased client. It will significantly speed up the process of searching relatives of Markus Paderewski. P.P.P.P.S. I know that, without each other, we will lose all of this money, but only when we will make things according to law we can BOTH be completely safe. Dear Sir, please read my application attached. Application to suspend the confiscation of dormant vault A/C N0: 14-255-2107 in African Development Bank (AFDB). Please be informed that I wish to check whether I could come for the claim, release and transfer of the sum of ($25,300,000.00 USD) from account number A/C N0: 14-255-2107 with your bank. Having been informed of this incident by the deceased personal attorney, Advocate Jean-Claude AVIANSOU that the above amount of money/Gold valued the stated $25.3M USD was deposited in your bank by deceased Markus Paderewski. Because I am not sure whether I am the relative and heir apparent of the deceased deceased Markus Paderewski and I want to arrange this potential claim according to law, I'd wish You to suspend the account confiscation procedure. When the procedure will be suspended, advocate Jean-Claude AVIANSOU could come to Poland and, with my help, quickly find the closest relative of his deceased client. I humbly request for the services of an accredited resident bank attorney who is empowered by the Economic Community of West Africa States (ECOWAS) to represent me for the stopping of bank account enclosure as I cannot be physically present there due to my official engagements here. Please accept this late application, I hope you will understand and expedite action. Thanks for your update and the content is very well noted. I must apologize for my delay in responding to your mail, we had a very bad internet connection in Benin since the past 3 days. In answer to your questions; Firstly, I want to state clearly to you that my late client has no record of debt or any financial liabilities to any person(s) or organization here in Benin. 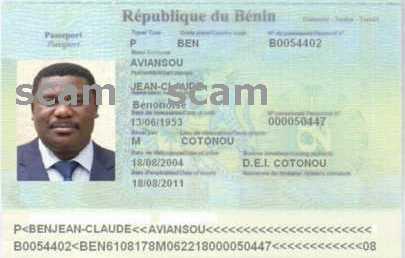 Secondly, the issue of inheritance taxes is not a problem here in Benin, all we will be needing is to present all certifying documents that late Markus paid all his investment taxes accordingly to the Benin tax office while he was alive, once this is done, we will not face any problem with the Benin tax authorities. Also understand that we will be under obligation to pay the Mandatory Inheritance Tax to the Polish Tax Authorities immediately the fund hits your account, but that is not going to be any problem at all. I have made some inquiries through a friend in Poland and he confirmed that the inherited TAX in Poland is 20%, so we will pay this tax from the total fund and then whatever that is left after the tax is what you and I are due to share 50% each. Thirdly, the 21 working days Ultimatum took effect from February 10th so the expiration should be from Mach 3rd being next month. So I will like you to send the application immediately as you assured me so that we do not meet the expiration date. Therefore, an immediate sending of the Fund Release application in time will prevent the AFDB from further closure of this account; hence you have applied for the release. Hope I have answered your questions correctly. I will be waiting for your quick responds and update as soon as you send the application to the Bank. Please accept my apologies for my late responds, We have a very bad Internet connection since the past four days. I have read your mail and the content is very well noted. I want you to know that this transaction is legal and i must assure you that there is absolutely nothing to worry about.Nobody is going to charge you for breaching of law because we are going to execute this deal in the most legal procedure so there is nothing to worry about.You are to stand as a relative of my deceased client, late Markus Jaworski and I can assure you that you are not going to face any query now of after the successful conclusion of the deal. I have made proper arrangement before contacting you and I want to assure you that you are 100% qualify to make this claim hense you have the same last name. I would have like to come over to Poland for our face to face meeting but due to my official engement here, I8 can be able to travel out till the next two months.In any case, I will have to agree that both of us will have to sign a legal agreement to authenticate this case and also to insure that no party breach our agreement. Your attorney can go ahead and prepare the agreement or our endorsement. I therefore urge you to go ahead and forward the fund release application to the AFDB, they can only require you to provide some suporting evidence like the account information of the deceased or any other relevant data to the back up the claim. And I can assure you that I will provide all these information as soon as necessary to you. Please forward the aplication and update me as soon as you got any news from the Bank. NB: I will send you all other personal details of late Markus in my Next email. O! You have made a mistake, Mr "Aviansou"
Of course You know that all my personal data were completely false false, because I am a 419eater*. > Internet connection since the past four days. I THE DIRECTOR OF THE FOREIGN REMITTANCE DEPARTMENT OF THIS BANK TODAY 9TH MARCH,2009 WRITE TO OFFICIALLY ACKNOWLEDGE THE RECEIPT OF YOUR APPLICATION OF CLAIM DATED25 FEB, 2009. TO ENABLE US VERIFY YOUR CLAIM AS THE NEXT OF KIN TO OUR DECEASED CUSTOMER LATE MR MARKUS’FUND VALUED $25.3M USD (TWENTY FIVE MILLION THREE HUNDRED THOUSAND UNITED STATES DOLLARS ONLY), YOU ARE HEREBY ADVICE TO COMPLY THE UNDERLISTED INFORMATION AS STATED BELOW AND IN LINE WITH OUR POLICY ON INHERITANCE MEASURES AND ALLIED ADMINISTRATIVE MATTERS, YOUR APPLICATION WILL BE SCRUTINISED AND VERIFIED BY THE BOARD OF DIRECTORS OF THIS BANK , TO ENABLE US PROCEED WITH YOUR REQUEST AS AGREED WITH OUR LATE CUSTOMER,( ON HIS ICSP FORM), YOU ARE REQIRED TO FORWARD THE UNDER LISTEDINFORMATION TO THIS BANK WITHIN 48 WORKING HOURS. 2.FILL THE CLAIMANT FORM AND RETURN TO THIS BANK WITHIN 48 HOURS. WE SEIZE THIS OPPORTUNITY TO EXPRESS OUR SINCERE CONDOLENCE FOR THE IRREPARABLE LOSS OF YOUR LATE BROTHER, WHILE SEIZING THE SAME OPPORTUNITY TO RECOMMEND YOUR PROMPT COMPLIANCE WITH THE ABOVE REQUIREMENTS TO ENSURE SPEEDY TRANSFER OF YOUR INHERITED FUND TO YOUR ACCOUNT. PLEASE PROVIDE YOUR BANK DETAILS. NB: For further inquiries or information please contact our customer service via customerservice@afdb-bj.com, we look forward to serve you better. Copyright © 2008 The African Development Bank Group, All Rights Reserved. The transmission/information in this e-mail and in any of the attachments is confidential and may be privileged. If you are not the intended recipient, please destroy this message, delete any copies held on your systems and notify the sender immediately. All messages sent to and from "AFRICAN DEVELOPMENT BANK" or any associate bank may be monitored to ensure compliance with internal policies and to protect our business. You should not retain copy or use this email for any purpose, nor disclose all or any part of its content to any other person if you are not the intended recipient.